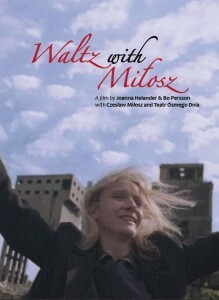 Waltz with Milosz (2012) was filmed in the Polish cities of Kraków, Poznan, Ruda Slaska, as well as in Ale Stenar and Stockholm Sweden. The film has a poetic character of its own.The leading actress from the legendary Polish “Eighth Day Theatre (Teatr Osmego Dnia)”, Ewa Wojciak, meets the Nobel prize-winner in literature Czeslaw Milosz in Kraków. Scenes from their encounter are interwoven with scenes from “Eighth Day Theatre” performing in the post-industrial landscape of Poland. Czeslaw Milosz tells jokes and anecdotes with laughter and charm but he also comments on the painful events of the last century. Czeslaw Milosz was one of the first dissidents from Eastern Europe in the early 1950´s and the “Eighth Day Theatre” played a central role in the independent culture in Poland starting in the 1970´s. The poet Ryszard Krynicki from the Polish “New Wawe” and the publisher Jerzy Illg also takes part in the film with a music score of Antonin Dvorak and Zygmunt Konieczny. The Swedish version of the film is set to premiere in 2013.